The Register House at Edinburgh contains the Scottish national archives, and is the oldest surviving record office in the world. It was built on Princes Street, opposite the entrance to the North Bridge, and was publically funded, with the first £12,000 being taken from confiscated estates which had belonged to Jacobite rebels of the ’45. In around 1770 Robert and James Adam were employed to make plans for the building by the Lord Register of Scotland, Lord Frederick Campbell, their patron at Ardencaple, Argyll in 1762-74; Combe Bank, Kent in 1767-77, and Petersham Lodge, Kent, ND. This arrangement was formalised in 1772, when a committee minute records that the Adam brothers’ plans were approved, and the site on Princes Street had been purchased. Their contract stated that the Adam brothers would provide all necessary drawings and visit the site once every one or two years, with remuneration equivalent to 2.5% of the total building cost, plus 50 guineas for each journey to Edinburgh. A clerk of works, James Salisbury (ND) was appointed, with an annual salary of £100, and notes on various drawings show that it was to Salisbury that Adam's presentation drawings were sent. Robert and James Adam were present in 1774 for the laying of the foundation stone, but during their long subsequent absences while in London, their older brother John acted as executant architect. Adam’s design comprises two storeys over a part-sunk basement, with a central rectangular courtyard containing a large rotunda, top-lit by an oculus, and within which is a reading room. The designs made special provisions to keep out damp, and to protect from fire, by the inclusion of brick vaults, flagstone floors, chimneypieces in almost every room, and a furnace-powered flue system to aerate and heat the central rotunda. In a letter to Lord Frederick Campbell, Robert Adam expressed an expectation that the building would be completed in 1777, but this was not the case owing to financial difficulties, and complaints by contractors. By 1779 the work was still far from complete, and the budget completely subsumed. Construction was halted, and the building remained an incomplete shell until work restarted in 1785. The rotunda was completed in 1788, and in 1789 the national records were moved from the Laigh Hall of the Parliament House – long considered unsuitable as a repository of this sort – and housed in their new accommodations. Work continued until Robert Adam’s death in 1792, at which time the building was finally, largely complete, save the north wing, and the interior decoration. The erection of the north wing – to a slightly modified design – and the completion of the interior were overseen by Robert Reid (1774-1856) in 1822-34, bringing the total cost of the complete building to £91,000. Further to the Register House itself, Adam also provided unexecuted designs for a Deputy Register’s House, a guard house, and a block of ten terraced houses along the north side of Leith Street, on the eastern side of the Register House. 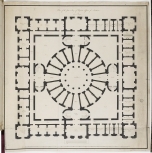 The trustees of the Register House had control of the north side of Leith Street, and in 1785 commissioned Adam to made designs for the plot. Following the curve of the street, Adam designed two variant schemes for a block of ten terraced houses with shops below. These differed only in the ornamental detailing to the façades. Neither of these schemes was built, and instead a series of much simpler houses were built, which were demolished in the mid-twentieth century. There is a collection of Adam office drawings for the project within the collection at the Register House. Moreover, the building was illustrated in the first volume of the Works in architecture of Robert and James Adam (1774), including plans of the ground and first storeys, an elevation of the principal front, and an axial section through the centre of the building from north to south.